Would I be angry? Blinding rage. Would I want justice? Blood-thirsty. Would I be willing to do anything to protect my family from further harm? Without hesitation. But would I blame Sarah Palin (or any other politician) for what they said, didn't say, or posted online? No, I'd blame the shooter. Would I blame semi-automatic weapons or the NRA for allowing the shooter to have a gun? No, because one person's misuse of a weapon doesn't discolor all guns or a group of gun advocates. We want to blame other people, especially those with whom we have problems, for causing situations rather than either placing the responsibility where it needs to go or accepting our own part. For example, if you're feeling discontent towards your pastor, you're more likely to criticize him for not visiting you in the hospital instead of realizing that you've distanced yourself from church members who aren't mind readers. If you feel you deserve a raise at your job, you're more likely to criticize your boss or company instead of realizing you haven't really talked with the boss about your concerns. So, it's not surprising people want to blame Sarah Palin and the T.E.A. Party for this shooting because so many disagree with their statements and positions on issues. It's as if they want to toss out enough noise revolting against them so that surely other people will see how misguided Palin, the T.E.A. Party and others are with their actions. In fact, it's quite the opposite. That sort of noise vomit shows how immature, mindless, and knee-jerk those people are with their emotional words and jaded viewpoints. 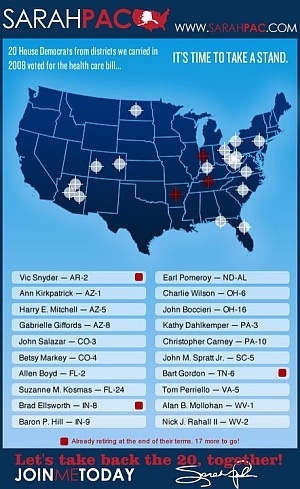 Many have commented on how irresponsible the map on the right is with its crosshairs referencing the names below, including Gabrielle Giffords. The outcry is this map encourages lunatics to shoot people. Really? So, if the map used red dots and someone used a laser-scoped rifle to kill - Palin & the map did it! If the map used X's and someone killed with a pick or knife - Palin & the map did it! Folks, crazy doesn't need a map to commit crazy acts. Crazy will do what crazy does. However, I'm more certain than ever that less crazy would breed if children were taught to value human life. From unborn babies to elderly, all human life is sacred. When people become objects, nothing good can come of that. But Saturday wasn't about Palin, maps, T.E.A. Parties, or the N.R.A. Saturday wasn't about our inability to disagree without being disagreeable. Saturday was about Christina-Taylor Green. 9 years old. Daughter. Sister. Grand-daughter. Third grader. Swimmer. Little league. Animal-lover. She'll never serve her newly elected post on the student council at Mesa Verde Elementary School. She'll never take lessons for the guitar she received at Christmas. She'll never experience life to its fullest. Christina already made a name for herself being born on September 11, 2001. She likely would've helped change her corner of the world for the better. Instead, she's impacted that corner through her death. Born on a day of national terrorism and dying at the hand of a single terrorist, she's impacted an entire nation. What if it were my daughter? What if it were your daughter? Would you react differently? Slow down, stop, listen, think, and speak only if needed. Pray for these victims, their families and friends, and our nation. 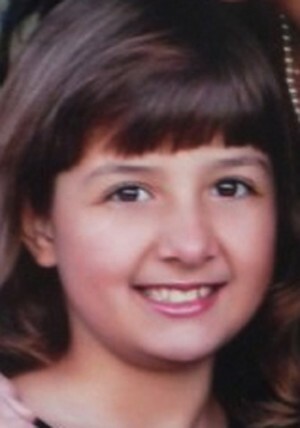 Most of all, pray for Jared Loughner. Whether you believe it our not, he needs to know the love of Christ Jesus. He'll face the consequences of his actions here on earth but if he rejects God he'll face those consequences for eternity. I have heard your sentiments in many places these last two days. I agree with some of what you say and disagree with much. However, let me say this. I think your premise is entirely wrong. I don't think you can presume to put yourself in the mind of Christina's parents. As one who has lost a member of my immediate family from a similar attack, I can tell you that you would most likely be immobilized with immense grief. You probably wouldn't be able to get beyond the grief and the "I can't believe this happened" stage for months if not years. You wouldn't have the heart to stand on a stump and make a political statement as you are indeed making here. You would just grieve. And you would continue to do this for the rest of your life. Yes, prayers should be our first response. In that I agree. Anonymous, thanks for sharing your thoughts here. My post was not an attempt to put myself in the mind of Christina's parents. On the contrary, the post's title and my attempt was to reflect on how I might react to such a tragedy. While I touch on this, it's quite impossible to presume my feelings and perceptions if this were my own child. While the event would be life-changing and the healing slow, I would rest on my faith in Christ to know there was a reason for such a tragedy and for Him to guide me though the pain. You also elude to my post being a political statement. Actually, I'm addressing that far too many people have made this a political issue and aren't focusing on the human factor.